Tomorrow War (The Chronicles of Max Redacted) is a story written in a time passed. There were some situations that were put into action that drove the world into a new and dark time. People didn’t know what to do, how to get their next meal, or how to protect themselves and their family. They turned others for help and were denied or asked to do terrible things. 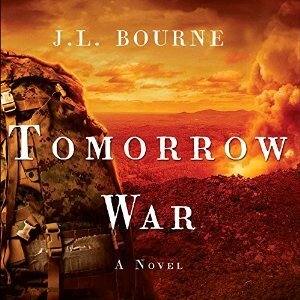 Tomorrow War tells of Max, the “hero” of the story, a trained military man who takes a vacation and prepares for a small glitch in some of the world’s computers. Little does he know it’s about to turn in to so much worse. Narration for Tomorrow War was done by Kevin T Collins and Jay Snyder. I am familiar with Collins work and he does another superb job in this. The narration was crisp and concise. Told like a military man would. The voice is harsh and to the point, exactly as the character Max was written to be. I can’t find a single flaw in this audiobook. The way this story was told was through journal entries, but only when a “computerized” voice cuts off some of the recordings or the words “redacted” are said out loud (used in classified documents to black out text) you couldn’t really tell that was the way it was written. But feeling like it was literally taken from a classified document made this have a totally unique and new feel to it. I have not read the Day by Day Armageddon series by J.L. Bourne, and now I’m rethinking it. I really enjoyed Bourne’s matter of fact characters. I liked that the main character was trained to survive but not for the reason it was originally meant. I think that the character development in this book was awesome. Seriously, I wasn’t sure what was going on in the beginning, then everything starts to fall apart, and Max really comes into his own after that. The story starts off slow, reminded me a bit of The Bourne Identity if Jason Bourne was thrown into a violent society. The book gets off to a slow start, but that doesn’t last long. Fast-paced and full of incredibly life-altering moments throughout. This book really had it all, it was action-packed with great characters. It was developed without feeling bogged down. I also love the society that Bourne creates. I mean, I don’t like what it became, but I liked how it felt real and gritty. It was exactly what would happen in that situation. I also like that it was a standalone. I mean Bourne could easily write more in the series, from Max’s point of view or not. It is a fascinating world. But I’m glad that there is one book too. That doesn’t happen too often. A fantastic story told from a unique point of view. I’m really glad I listened to this book.